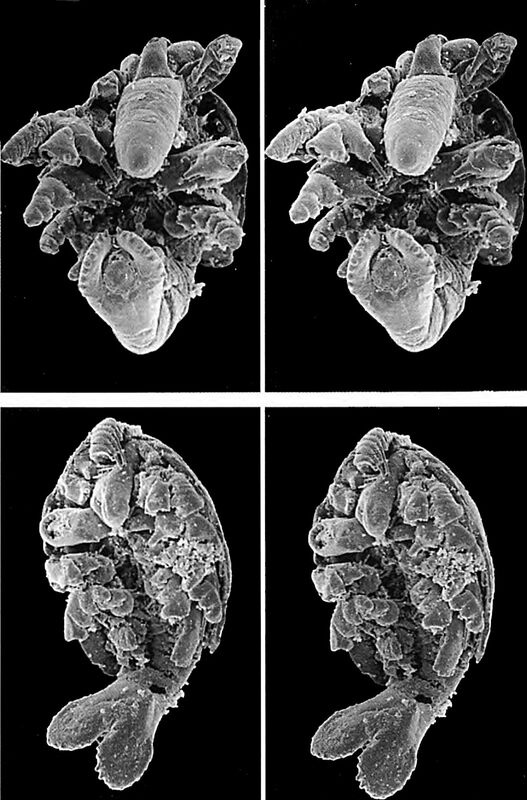 ﻿Already ﻿in ﻿the ﻿1980s ﻿we ﻿had ﻿started ﻿to ﻿produce ﻿stereo ﻿images ﻿of ﻿our ﻿specimens. 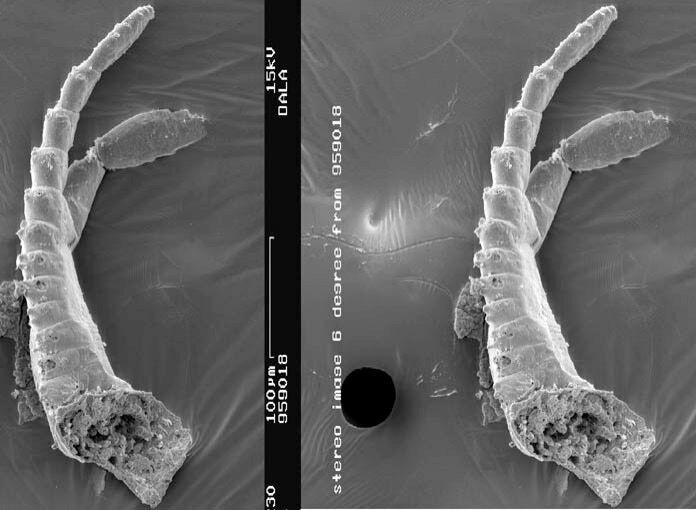 ﻿These ﻿were ﻿photographed ﻿at ﻿different ﻿tilting ﻿angles ﻿under ﻿the ﻿SEM ﻿and ﻿then ﻿combined ﻿to ﻿be ﻿viewed ﻿with ﻿special ﻿stereo ﻿spectacles. 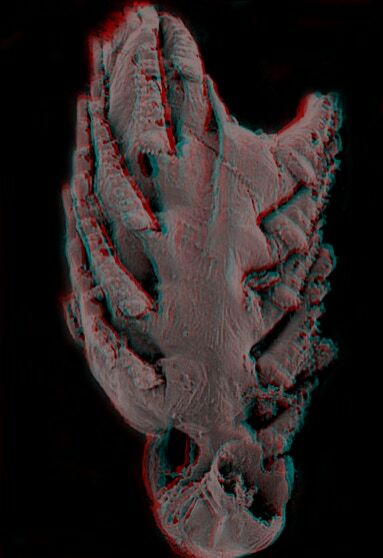 ﻿At ﻿that ﻿time ﻿it ﻿was ﻿fairly ﻿popular ﻿also ﻿to ﻿publish ﻿such ﻿stereo ﻿images, ﻿at ﻿least ﻿in ﻿the ﻿Palaeontology. ﻿The ﻿fixed ﻿angle ﻿at ﻿photography ﻿and ﻿fixed ﻿distance ﻿at ﻿combining ﻿the ﻿two ﻿images ﻿are, ﻿however, ﻿a ﻿problem ﻿for ﻿many ﻿people, ﻿who ﻿have ﻿problems ﻿to ﻿combine ﻿the ﻿images ﻿into ﻿a ﻿single ﻿stereo ﻿view ﻿when ﻿looking ﻿into ﻿the ﻿gap ﻿between ﻿the ﻿photographs. ﻿Point ﻿to ﻿point ﻿should ﻿be ﻿roughly ﻿8–9 ﻿cm, ﻿but ﻿that ﻿does ﻿not ﻿work ﻿in ﻿the ﻿case ﻿of ﻿far-sighted ﻿people, ﻿me ﻿included. ﻿It ﻿should ﻿be ﻿noted ﻿that ﻿orientation ﻿of ﻿the ﻿objects ﻿is ﻿important ﻿as ﻿well ﻿as ﻿the ﻿relief. ﻿Our ﻿animals, ﻿arthropods ﻿or ﻿crustaceans, ﻿in ﻿particular ﻿have ﻿limbs ﻿that ﻿stick ﻿of ﻿from ﻿the ﻿surface, ﻿which ﻿diminishes ﻿the ﻿stereo ﻿effect. ﻿So, ﻿better ﻿a ﻿lengthwise ﻿oriented ﻿object ﻿than ﻿horizontally ﻿extended, ﻿a ﻿half ﻿sphere ﻿is ﻿as ﻿bad ﻿as ﻿a ﻿curved ﻿C. ﻿The ﻿very ﻿slim ﻿Skara ﻿was ﻿a ﻿bad ﻿object ﻿compared ﻿to ﻿others. ﻿An ﻿easy ﻿way ﻿for ﻿presentation ﻿without ﻿special ﻿lenses, ﻿is ﻿preparing ﻿stereo ﻿images ﻿for ﻿use ﻿of ﻿red-green ﻿glasses. ﻿One ﻿can ﻿even ﻿use ﻿old ﻿pictures. ﻿Disadvantageous ﻿is ﻿that ﻿people ﻿with ﻿difficulties ﻿to ﻿distinguish ﻿these ﻿colours ﻿can' ﻿see ﻿the ﻿stereo ﻿effect. ﻿Yet, ﻿the ﻿method ﻿does ﻿not ﻿require ﻿complicated ﻿arrangements ﻿of ﻿the ﻿pictures ﻿next ﻿to ﻿each ﻿other. ﻿In ﻿both ﻿cases, ﻿black ﻿and ﻿white ﻿above ﻿and ﻿red-green ﻿– ﻿and ﻿it ﻿takes ﻿only ﻿a ﻿few ﻿minutes. ﻿Even ﻿more, ﻿the ﻿images ﻿can ﻿be ﻿pretty ﻿small ﻿to ﻿still ﻿show ﻿the ﻿stereo ﻿effect. ﻿1. ﻿All ﻿you ﻿need ﻿for ﻿this ﻿easy ﻿way ﻿of ﻿having ﻿nice ﻿stereo ﻿images ﻿on ﻿your ﻿website ﻿is ﻿a ﻿program ﻿like ﻿Adobe ﻿Photoshop, ﻿a ﻿pair ﻿of ﻿stereo ﻿images ﻿and ﻿red-green ﻿spectacles. ﻿I ﻿have ﻿ordered ﻿some ﻿from ﻿a ﻿company ﻿on ﻿the ﻿Web, ﻿but ﻿you ﻿may ﻿get ﻿them ﻿in ﻿a ﻿toy ﻿shop ﻿too. ﻿Note ﻿that ﻿TV ﻿spectacles ﻿are ﻿useless ﻿because ﻿the ﻿colours ﻿are ﻿not ﻿suitable ﻿and ﻿you ﻿will ﻿not ﻿get ﻿a ﻿good ﻿stereo ﻿effect. ﻿2. 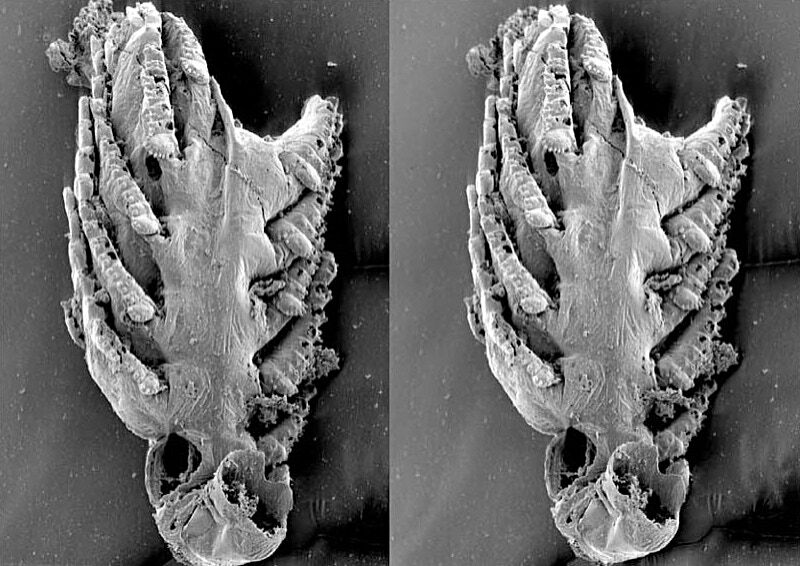 ﻿To ﻿start ﻿with, ﻿you ﻿can ﻿download ﻿these ﻿two ﻿stereo ﻿pairs ﻿of ﻿images. ﻿They ﻿don't ﻿fit ﻿too ﻿well, ﻿but ﻿are ﻿good ﻿for ﻿practising ﻿(the ﻿animal ﻿is ﻿called ﻿Dala ﻿peilertae ﻿and ﻿is ﻿a ﻿small ﻿Orsten ﻿crustacean, ﻿the ﻿pictures ﻿depict ﻿a ﻿trunk ﻿limb ﻿and ﻿a ﻿part ﻿of ﻿the ﻿trunk ﻿from ﻿ventral). ﻿Double-click ﻿on ﻿them ﻿to ﻿receive ﻿the ﻿larger ﻿versions ﻿and ﻿copy ﻿them ﻿to ﻿your ﻿computer. ﻿Then ﻿cut ﻿the ﻿images ﻿in ﻿a ﻿program ﻿like ﻿Adobe ﻿PS ﻿to ﻿have ﻿a ﻿left ﻿and ﻿right ﻿picture. ﻿That ﻿you ﻿have ﻿the ﻿left ﻿one ﻿left ﻿you ﻿can ﻿see ﻿by ﻿clicking ﻿on ﻿them. ﻿The ﻿left ﻿should ﻿be ﻿tilted ﻿against ﻿the ﻿other ﻿one. ﻿3. ﻿Open ﻿the ﻿left ﻿of ﻿the ﻿images, ﻿then, ﻿if ﻿not ﻿done ﻿already, ﻿turn ﻿each ﻿partial ﻿image ﻿into ﻿RGB ﻿mode ﻿to ﻿make ﻿them ﻿coloured ﻿= ﻿24 ﻿bit ﻿(3X8 ﻿bit). ﻿Then ﻿open ﻿the ﻿tone ﻿correction ﻿tool ﻿(Apple ﻿or ﻿Cmd ﻿L ﻿on ﻿a ﻿Mac, ﻿most ﻿likely ﻿a ﻿similar ﻿short ﻿cut ﻿on ﻿a ﻿PC). ﻿The ﻿red ﻿one ﻿will ﻿be ﻿the ﻿future ﻿underlying ﻿one. ﻿Choose ﻿the ﻿channel ﻿scrollbar ﻿and ﻿wipe ﻿out ﻿green ﻿and ﻿then ﻿the ﻿blue ﻿by ﻿choosing ﻿the ﻿lower ﻿horizontal ﻿bar ﻿(not ﻿the ﻿one ﻿underneath ﻿the ﻿histogram). ﻿Just ﻿pull ﻿it ﻿to ﻿zero ﻿and ﻿you ﻿will ﻿see ﻿the ﻿effect, ﻿a ﻿red ﻿image. ﻿4. ﻿Then ﻿choose ﻿the ﻿other ﻿(future ﻿right) ﻿image ﻿and, ﻿similarly, ﻿make ﻿it ﻿blue-green ﻿by ﻿wiping ﻿out ﻿red. ﻿The ﻿result ﻿is ﻿a ﻿green-blue ﻿image. ﻿Both ﻿images ﻿should ﻿then ﻿be ﻿tone-adjusted ﻿using ﻿the ﻿same ﻿tool ﻿and ﻿adjust ﻿black, ﻿middle ﻿and ﻿white ﻿level. ﻿That's ﻿most ﻿of ﻿the ﻿jobs ﻿done ﻿already. ﻿A ﻿tip: ﻿the ﻿background ﻿should ﻿be ﻿dark, ﻿because ﻿it ﻿lay ﻿disturb ﻿the ﻿stereo ﻿effect. ﻿I ﻿did ﻿this ﻿with ﻿the ﻿two ﻿images. ﻿5. ﻿Pull ﻿the ﻿green-blue ﻿image ﻿on ﻿top ﻿of ﻿the ﻿red ﻿one ﻿(appears ﻿in ﻿an ﻿overlaying ﻿layer ﻿in ﻿Photoshop). ﻿Select ﻿the ﻿layer ﻿for ﻿the ﻿green ﻿image ﻿(by ﻿opening ﻿the ﻿layer ﻿window) ﻿and ﻿change ﻿to ﻿about ﻿46 ﻿% ﻿opacity ﻿(100% ﻿is ﻿fully ﻿visible, ﻿0% ﻿is ﻿invisible, ﻿and ﻿anything ﻿in ﻿between ﻿are ﻿degrees ﻿of ﻿transparency). ﻿I ﻿had ﻿to ﻿tilt ﻿the ﻿top ﻿image ﻿a ﻿little ﻿to ﻿get ﻿a ﻿better ﻿stereo ﻿effect. ﻿Then ﻿using ﻿the ﻿red-green-blue ﻿spectacles ﻿one ﻿has ﻿to ﻿click ﻿on ﻿the ﻿cursor ﻿buttons ﻿until ﻿the ﻿best ﻿result ﻿is ﻿reached. ﻿Now ﻿you ﻿can ﻿see ﻿both ﻿images ﻿in ﻿one. ﻿If ﻿they ﻿are ﻿too ﻿dark, ﻿use ﻿the ﻿tone ﻿correction ﻿again ﻿for ﻿each ﻿layer ﻿and ﻿adjust ﻿light ﻿and ﻿grey ﻿levels ﻿to ﻿you ﻿wishes. 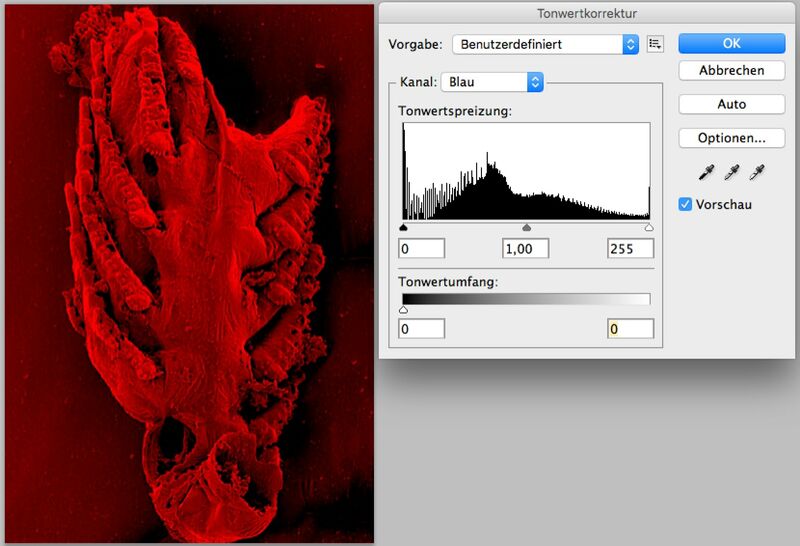 ﻿It ﻿is ﻿always ﻿better ﻿to ﻿use ﻿eraser ﻿tools ﻿to ﻿wipe ﻿out ﻿the ﻿surroundings ﻿of ﻿the ﻿specimen ﻿on ﻿the ﻿blue-green ﻿image ﻿and ﻿in ﻿most ﻿cases ﻿to ﻿darken ﻿the ﻿background ﻿around ﻿the ﻿specimen ﻿in ﻿red ﻿too ﻿(but ﻿see ﻿the ﻿phosphatocopine ﻿below). ﻿After ﻿all ﻿is ﻿done ﻿you ﻿can ﻿adjust ﻿the ﻿image ﻿down ﻿to ﻿a ﻿suitable ﻿size ﻿and ﻿save ﻿it ﻿either ﻿in ﻿a ﻿PS ﻿file ﻿or ﻿the ﻿final ﻿tiff ﻿or ﻿jpeg. ﻿That's ﻿it. ﻿The ﻿first ﻿try ﻿(quick ﻿and ﻿dirty) ﻿should ﻿not ﻿take ﻿more ﻿than ﻿5 ﻿minutes. 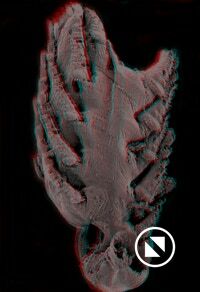 ﻿Example ﻿images: ﻿Enjoy ﻿this ﻿set ﻿of ﻿stereo ﻿images ﻿of ﻿some ﻿of ﻿our ﻿500,000,000 ﻿years ﻿old ﻿fossils ﻿in ﻿3D. ﻿All ﻿you ﻿need ﻿are ﻿red-green-blue ﻿spectacles; ﻿TV ﻿glasses ﻿are ﻿less ﻿useful ﻿since ﻿their ﻿red ﻿is ﻿too ﻿dark ﻿and ﻿green ﻿to ﻿light). ﻿You ﻿will ﻿see ﻿that ﻿not ﻿all ﻿specimens ﻿and ﻿views ﻿work ﻿well.